England will “go to bed dreaming about getting Virat Kohli out” as they look to win the first Test against India, says bowler James Anderson. India – set 194 for victory – closed day three on 110-5, with captain Kohli unbeaten on 43. 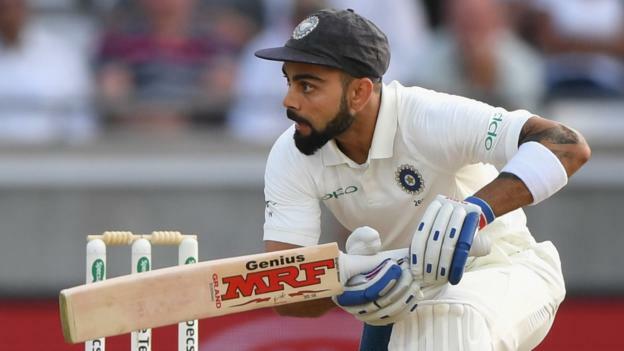 He made 149 in India’s first-innings 274 and steadied India after they slipped to 78-5 on Friday at Edgbaston. “No-one is invincible in world cricket. We can get him out,” said Anderson, England’s leading wicket-taker. Anderson dismissed Kohli four times in 10 innings on India’s previous tour of England in 2014. However, Kohli adjusted his technique, playing more on the front foot, in order to negate the moving ball. “I’ve been encouraged by the way I’ve bowled at him in this game,” said Anderson, who had Kohli dropped on 21 in the first innings. “I found the edge a few times in the first innings. On another day I could have got him and we could be in a much different position now. England collapsed to 87-7 in their second innings on Friday before Sam Curran’s 63 helped them to 180. Stuart Broad took two wickets in two overs as India slipped to 78-5 in pursuit of their highest successful chase in England. Anderson said of Curran: “I remember me as a 20-year-old, and I didn’t know what was going on. I was in awe of everyone. “But he’s been around quite a bit and he knows his game really well for a young lad. Anderson, Curran and Ben Stokes claimed a wicket apiece but Kohli and Dinesh Karthik’s unbroken 32-run stand left India needing a further 84 to win on Saturday. “A couple of early ones tomorrow and both teams will be a bit nervous,” left-arm seamer Curran told BBC Test Match Special. India pace bowler Ishant Sharma took 5-51 – including three wickets in an over – to undermine England’s second innings. He said Kohli’s continued presence gives India “a lot of confidence” that they can take a 1-0 lead in the five-match series. “Virat has scored 150 in the last innings,” said Ishant. “Cricket is such a game that you can chase down small totals easily with one big partnership.